MAC is pleased to present Seeing Is Believing,an exhibition of works by Kim Alsbrooks, Mary Henderson, Drew Leshko, John Slaby and Jennifer Williams. Seeing is Believingexplores how these five artists utilize the accessible language of realism to transport the viewer to a new understanding or belief. The visual language of realism offers vocabulary and grammar that is shared by teller and listener. It is highly communicative and capable of offering an experience that is both extraordinary and uncanny with the artist’s selective attention to details. It’s been well over a century since the camera liberated the artist from the need to create art that is representational. Technology today has made documenting events, places, and people in our lives easy, and we are living in a world that is saturated with images. Yet these artists use the familiar language of realism in subtly unique ways, moving the image beyond illustration and documentation. They create fiction from nonfiction, similar to how all of us reinterpret and reassemble images in our subconscious minds from what we see before us. Another component of realism is that it demands a high level of craftsmanship. Realism requires techniques and skills to move the art beyond awkward representations of life and into an experience with images that permits the viewer to believe what they see and to be transported. All five artists create works that permit the viewer to suspend disbelief and be immersed because of their mastery of technique. Mary Henderson marries the vocabulary of the digital snapshot photo with the painstaking techniques in traditional figurative painting in her examinations of crowds in public spaces. Taken from concerts, sporting events, protest and exhibitions, the large groups of people are depicted out of context with minimal cues regarding location. Her paintings represent people at unguarded moments of vulnerability, reflection or preoccupation. Consequently Henderson leaves it to the viewers and their experiences and biases to “see” the crowd. John Garrett Slaby’s meticulous approach to painting comes from a personal narrative and documents his pleasures with hoarding and dreaming. His paintings ironically invite the viewer to enjoy with him his fondness for solitude and unshared experiences. Slaby’s self-conscious paintings teeter between realism and superrealism creating uncertainty with what we think we understand. Jennifer Williams uses self-generated photographic imagery as found objects and constructs two- and three-dimensional large scale installations. Her attention to details and ability reassemble the documentary photography in her installations activate otherwise overlooked, negative, and passive spaces. Her work exploits the “realism” inherent in the photographic medium and uses it to change what we believe about space and form. This particular installation is part of a series of works titled This Dwelling and includes images taken from the artist’s former apartment of 23 years. The images are liberated from the static documentation and reanimated as large two- and three-dimensional compositions. Drew Leshko carves, cuts and layers varieties of paper and wood and painstakingly recreates buildings’ facades in an attempt to archive buildings that are in transitional periods. The relief works are at a 1:12 scale, representing the large structures at a conventional scale that permits the viewer to admire the entire building. Leshko finds beauty in the details and brings our attention to the accumulations that are often overlooked, such as the acid rain deposits and rust. These works are at once documentary, memorialization and nostalgic. 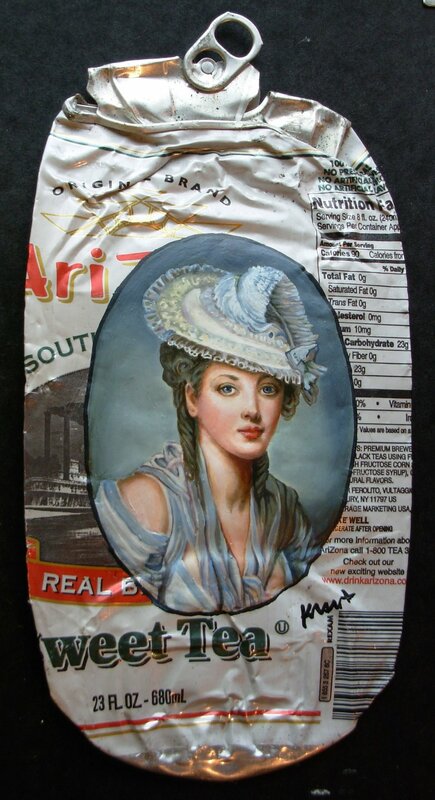 Kim Alsbrooks taps into the history of realism and portraiture. Alsbrooks snubs her nose at class distinction, by painting the portraits on trash and readdresses the meaning of these people in a new context. There is a balance between the sentimentality with selecting the portrayed figures and the appropriate trash to both contrast and support the person being represented. About MAC Mount Airy Contemporary was founded in 2009 by co-directors Andrea Wohl Keefe and Colin Keefe. Based in northwest Philadelphia, MAC has focused on providing low key, high quality art experiences in an informal residential setting.